Looking for a quiet yet pleasant accommodation where you can relax from the stresses of everyday life for a few days? Then you are exactly right! A 10 m long terrace ideal for relaxing, barbecuing and enjoying. The apartment is bright and equipped with new modern furniture. A hidden gem. Living room and dining room adjacent to semi-open kitchen. The bedroom has a king size bed (180x200) with generous matching wardrobe. The stylish bathroom has a shower bath. All electrical appliances (cooker, hob, microwave, coffee maker, TV, etc.) are new and in very good condition. Spend some unforgettable days in the Harz Mountains, with its numerous hiking trails, lakes, activity programs and recreational facilities. This romantic holiday then rounds off your holiday perfect. And not expensive! Der Aufenthalt in der Ferienwohnung für ein Wochenende im Harz war sehr angenehm. Die Wohnung ist wie beschrieben und der Gastgeber sehr nett und zuvorkommend. Besonders gefallen haben uns die ruhige Lage, die gute Ausstattung sowie der unkomplizierte Check-in bzw. Check-out. Das Preis-Leistungs-Verhältnis ist absolut angemessen. Ein kleines Manko gab es aber dann doch: das Bett im Schlafzimmer knarrt fürchterlich bei der kleinsten Bewegung, die Matratzen könnten mal gewechselt werden und die Heizungen werden leider nicht wirklich warm. Dennoch empfehlen wir die Ferienwohnung gerne weiter. Schoene Wohnung fuer einen guten preis! Die wohnung hat uns echt gut gefallen, es ging alles sehr schnell und einfach. Die gegend war auch gut. Wir haben gut unsere wanderung machen koennen! Een paar hele fijne dagen doorgebracht in het appartement. Het is schoon en van alles voorzien. het ligt zeer gunstig en alles is snel te bereiken. Het bed is zeer goed. Leuke gezellige inrichting. De verhuurder is een zeer vriendelijke man. Contact is prima geweest, zowel via de mail als persoonlijk. Omdat de woning wel ingebouwd ligt door de bomen en struiken, was er in september weinig zon op het terras. Hierdoor was de woning zelf ook wat donker. Er is een stickie met een USB aansluiting voor internet aanwezig, maar hiervoor moet je zelf nog wel data kopen. Dat was voor ons een kleine tegenvaller. Wij wisten niet dat het pre-paid was. De woning is zeker aan te bevelen. 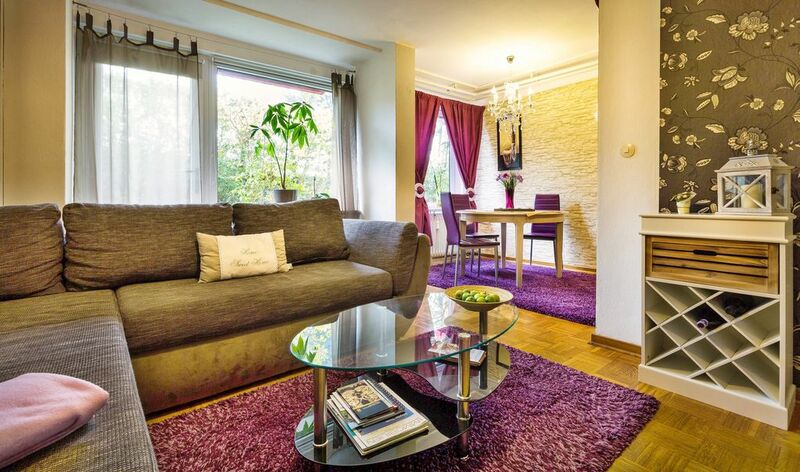 A wonderfully convenient location at the foot of the Oak Mountain in Bad Harzburg, personal care and look for something extra: That´s what you find at the stylish apartment 'Domizil ELEGANCE'. Enjoy the varied landscape, reside with charme and styl and do something good for body and mind, which is now possible in Bad Harzburg in exotic ways. Hardly at any other resort the healthy climate conditions here are a source for promoting your quality of life. Feel the atmosphere of elegant ambience surrounded by one of the oldest and most beautiful holiday regions of Germany. The apartment is situated at the foot of a magnificent mountain landscape of the national park 'HARZ'. Here is a visit to experience nature in all seasons. In the spring, when the dark pines beside the fresh grass appears deciduous trees. In summer, when the blooming mountain meadows, where the mysterious gloom of the spruce forests of red lights thimble, and also in autumn, when in the clear mountain air, the sun brings out the bright foliage color. His whole splendor of the Harz nature park develops in the winter, when a thick blanket of snow on lawns and soft-covered spruce trees are transformed into grotesque shapes, when the forest paths and mountain forests inspire with its enchanting landscape winter snow sports. Here it is very easy to recover from everyday stress! Because the house is located only 12 km from Goslar, a visit to this historic city with World Heritage Site by UNESCO is a must. Obige Preise verstehen sich als Komplettangebot inklusive aller Nebenkosten und Bettlaken für 1-2 Gäste. Jede weitere Person zahlt lediglich 8 € (0-15 Jahre = 6 €). Aus rechtlichen Gründen wird die Endreinigungspauschale von 25 € auf die Übernachtungskosten umgelegt. Bei Anfrage oder Buchung bitte angeben, ob Sie Bettwäsche für 7,50 €/Gast hinzu buchen oder in eigenen Bezügen schlafen möchten. In der absoluten Prime Time zum Jahreswechsel beträgt die Mindestbuchung 7 Nächte. Alle Gäste, die einen kürzeren Aufenthalt geplant haben, möchten wir freundlich bitten, einmal zu überlegen, wie nützliche es wäre, 1 ganze Woche für die Stimmungskanone Schneefreude zu reservieren. So viel Zeit muss sein! Buchen Sie 9 Nächte und zahlen nur 8!